Consumption of fruits in India is very meagre, and the consumption pattern differ in different income groups. 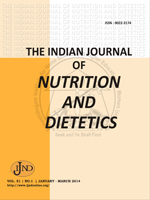 Lal Chand et al have reported that consumption of fruits was much higher in higher income groups. This paper reports the results of a survey conducted a salaried class who have a regular and assured income.